This is the book if you are learning to hand piece. QD2 - 144 pages, soft cover, stitched binding - optional CD. DVD lesson (110 minutes) included with every copy! If you are only buying one book about hand piecing, Quilted Diamonds 2 is the one I recommend because it includes the two-hour DVD lesson for the price of a book alone. It is a great value. Come take a private lesson with me, and discover the advantages of hand piecing with freezer paper templates! The hand piecing technique taught in Quilted Diamonds is universal. Even if you don't intend to sew any of the beautiful diamond designs in the book, this technique works for any design you want to hand piece! 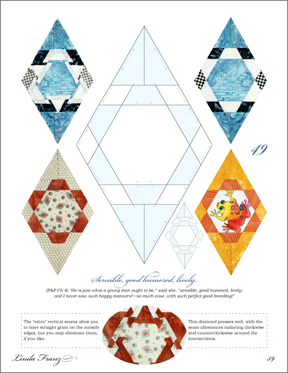 These—and all of the other shape collections under the Shop & Goodies tab—can be hand pieced with this method. Choose one of 101 diamonds, pick up a needle and thread & follow along with the DVD to begin your own heirloom. The diamonds are inspired by the Jane Austen coverlet, but are a different size. For a pattern for a replica quilt, please see Jane Austen Patchwork Mystery and the Main Jane Austen Page. Quilted Diamonds was the inspiration behind Inklingo. There is also a new Inklingo shape collection for QD! For most quilters, sewing with a running stitch is easier and faster and more portable than English Paper Piecing—and it is even faster and easier if you print the shapes on fabric with Inklingo. If you are stalled on Patchwork of the Crosses (POTC) or Passacaglia or any other quilt that you started with English Paper Piecing because it sounded like a good idea at the time, it is not too late! English Paper Piecing Rescue! Printing the cutting and stitching lines on fabric with your Inkjet speeds up the preparation even more and ensures accuracy. If you haven't tried Inklingo yet, I recommend starting on the Main Beginner's Page. If you have Electric Quilt software (EQ4 or newer), you may want to add the optional CD of patterns for $10.00, so you can print the QD patterns on freezer paper, instead of tracing. "Quilted Diamonds 2 with the CD and the DVD for $39.95 is a great value. It includes the lessons on the DVD that are a great substitute for a class, and better in some ways since it can be viewed over and over."